Going to the eye doctor for the first time can be a bit nerve racking. We get it. The unknown is a scary place and no one wants a stranger poking and prodding their eyes with weird metal gadgets. The mental picture painted by horror films and unpleasant trips to the dentist make even the strongest of stomachs squirm. However, eye exams don’t have to be scary! With a little advance information to soothe your nerves about the unknown, an eye exam can actually be quite pleasant. Preparation is key in acing any exam, even an eye exam. (We don’t mean trying to memorize the eye chart before arriving!) Before scheduling your appointment, make sure the optometrist or ophthalmologist you choose accepts your insurance plan’s vision coverage. During this time, it is imperative to ask if payment is required at the time of service. Once the financial matters have been resolved and the appointment is scheduled, ask what the exam will entail, how long it will last and if there will be any residual effects that might impair vision for driving. Knowing this information will help you safely arrange transportation home in case your eyes are sensitive from dilation. It is also wise to ask if there is anything you should bring. At your appointment, take full advantage of your doctor’s expertise by asking him/her how to prolong your vision for a clearer future. If a condition has been diagnosed during your exam, be sure to ask your eye care professional for information explaining the diagnosis, rather than going home and searching the web for answers. A new diagnosis may seem a bit frightening, depending on the severity of the condition, which is why it is important to ask your doctor if your condition is treatable. If your condition cannot be cured, you should ask your doctor for vital information on how to better understand your condition and what to expect in the future. Your eye doctor may not have all the information you want right at his finger tips, but he can tell you where to find it. Doctors have great references on file and these references are all more reputable than WebMD. 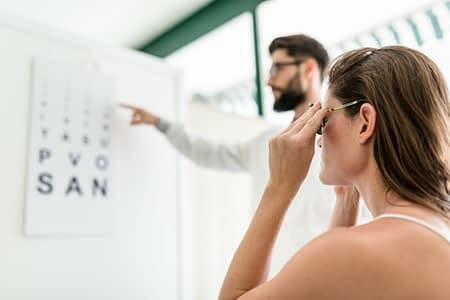 Before you leave your doctor’s office, ask your doctor if diet and exercise will help improve your eyesight, as overall health is very important to your vision. It is also recommended to ask when you should follow up for another eye exam. Just like a normal check-up, regular eye exams can even be scheduled before you leave the office. And lastly, if you need a prescription for glasses or contact lenses, be sure to get one before you leave so that you can easily get it filled. These simple questions are designed to help you get more out of your next eye exam and to put your nerves at ease. Just remember that your eye doctor is there to answer any questions you may have, so don’t be afraid to ask!